Our prices in 2018 will start at just £9 for a small, traditional Norway Spruce. £12 for our Value Line Non-drop Firs. Premium Non-Drop Nordman Firs will start at just £14. Our 6ft Non-drops start at just £24. With thousands of very fresh Christmas trees to choose from. We've tried to make our family-run, choose and collect, Christmas Tree farm a fun way of buying a real Christmas tree! Sorry - we do not deliver Christmas Trees or sell online - you have to come to us. Choose from thousands of trees, enjoy a fun time out and don't get stressed by delivery delays, broken trees, old stock or broken promises! We have been retailing Christmas trees for 25 years and growing them for 22 years. All our trees meet our very high quality standards and you buy one of the best trees available. We don't start cutting our Christmas Trees until the last few days in November and continue to cut them throughout December so your tree will be amongst the freshest available anywhere. 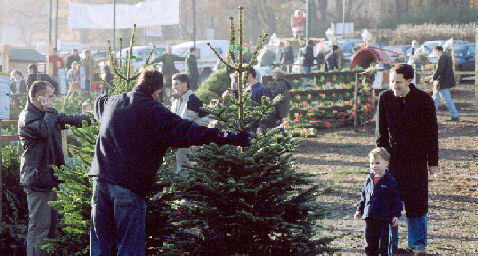 Most Garden centres and DIY shops sell trees that were cut in early November or perhaps even earlier. If your supplier has Christmas Trees delivered on a Pallet, they are probably not very fresh! We are one of the largest growers and retailers of Christmas Trees in the south-east of England so you'll have a huge choice of different trees to choose from - both traditional and non-drop. Our trees are un-netted before you choose them and our staff will then wrap them for your car and prepare them for your Christmas tree stand free of charge. They will even help you carry your Christmas tree to your car! We also sell Christmas decorations, and Christmas lights and Christmas tree stands in our shop. If you live in or near London and are looking for a fresh, real Christmas tree, that you can choose yourself, why not visit our farm in Chesham, Buckinghamshire. We accept all credit and debit cards (including Amex!!!). Sorry, we will no longer accept cheques. We hope to see youy soon!